A new Apple ad posted to YouTube on Thursday focuses on the company's worldwide effort to preserve and manage forestland, itself part of a wider goal to achieve a net-zero impact on the world's supply of virgin fiber. Arriving three months late, the Earth Day ad traces the origins of Apple's forestry program back to a dinner VP of Hardware Engineering Kate Bergeron hosted for a group of female senior executives in 2013. Present at the meet-up was VP of Environment, Policy, and Social Initiatives Lisa Jackson, who at the time was one month into her tenure. "We were drinking wine and Kate said, 'We should just buy a forest,'" said V.Y. Chow, data and environmental scientist at Apple. The off-the-cuff remark led to an investigation of Apple's impact on the world's forests. Thanks to its wildly popular product lines, Apple consumes a huge amount of virgin fiber, most of which goes into packaging. The aim shifted from buying a forest to preserving the resources Apple uses in its paper products. In 2015, the company took first steps toward that goal with the preservation of more than 36,000 acres of forestland in Maine and North Carolina. A month later, the green initiative was expanded with the creation of one million acres of responsibly managed forests in China. "At this point over 99 percent of the papers and fibers we use are responsibly sourced or recycled," said Connie Yang, who works in packaging product design at Apple. Apple hopes to reach one million acres of responsibly managed forestland by 2020. 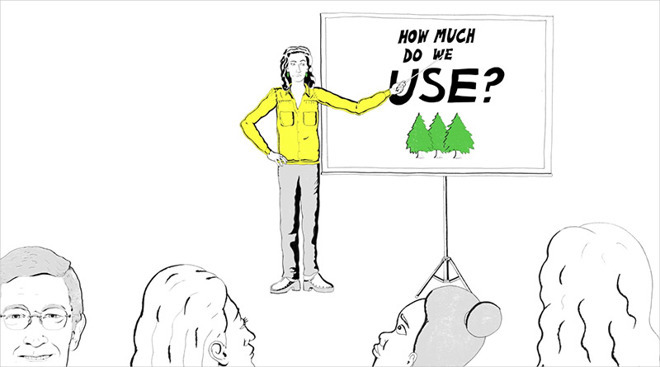 Today's ad was accomplished in a whimsical hand-drawn style identical to Apple's Earth Day series of videos that debuted in April. Those ads highlighted various internal initiatives designed to help mitigate Apple's impact on the environment, from the production of artificial sweat to keeping yaks on solar farms. A separate Earth Day 2017 video threw a spotlight on Liam, a specially designed robotic arm that disassembles iPhones and other gadgets into their component parts for recovery and recycling.